If all of your references to Oregon come from watching the show Portlandia, you may think of Oregon as a state stuck in the 90’s, but comedy tends to trivialize things. 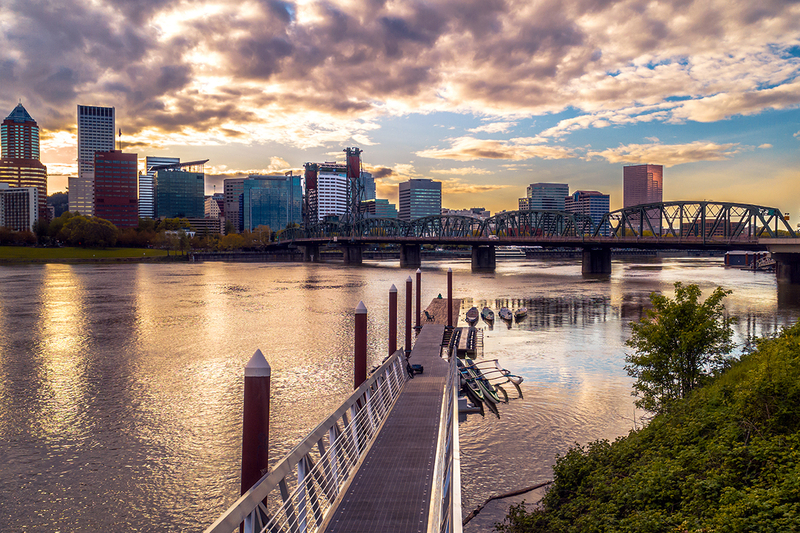 The city of Portland may be known for its quirky culture, iconic coffee shops, and farm-to-table restaurants, but it is in no way stuck in any time period. Oregon is vibrant, alive, beautiful and continuing to grow every day. In fact, technological advancements are a large economic force in Oregon, beginning in the 1970s with the establishment of the Silicon Forest, Intel and Tektronix. Oregon is also the home of Nike, Inc. headquartered in Beavertown, so come to Oregon and get your kicks! The geology in Oregon is timeless, marked by everything from deserts, forest, shrubland, volcanoes, and bodies of water. One of the most stunning landscapes can be found at Crater Lake Park. Located in the Cascade Mountains, this perfectly circular water-filled caldera of Mount Mazama is the deepest lake in Oregon, with breath-taking lava cliffs of up to 2,000 feet surrounding it on all sides. The Mount Hood National Forest is another part of the state’s scenic splendor. With a peak of 11,239 feet, Mount Hood is the highest mountain in the state, and a challenge to all comers. Those who want to get a view of the ski hills, scenic viewpoints, and hiking trails can do so on the Mountain Hills Scenic Loop. However, if you’re more of an out-of-the-loop type, the forest encompasses some gorgeous hot springs and waterfalls which you can discover on your own. After seeing Mount Hood, you may want to go to hell — Hell’s Canyon Dam, that is. Not for the faint of heart, the United States’ deepest river gorge is a remote region with twisting turns, hills and valleys, rough terrain, and vegetation. Delineated by the curving Snake River, the dam lies over a mile below Oregon’s west wing, and 8,000 feet below the He-Devil Peak of Idaho’s Seven Devil Mountains, and don’t bet on cell phone reception. Once you’ve survived hell, the only logical destination would be Happy Valley. One of the most peaceful, tranquil areas of Oregon to live in, Happy Valley is centered around community. In Happy Valley, all trails lead to the heart. The park serves as the center of the city, with natural and manmade paths leading from it to interconnect the surrounding neighborhoods. Crime in Happy Valley is low, and it is only about 45 minutes away from Mount Hood and Oregon beaches. With a set-up like that, who wouldn’t be happy? As for the real Portland? The city’s food, wine, beer, and spirits have earned it recognition as The Beer and Food Cart Capital of the world. You can’t drive for an hour without hitting one of the city’s wineries, and you can’t drive more than 15 miles from downtown without hitting the city’s countryside. There are over 70 breweries, a sprawling landscape, punk rockers, up-and-comers, and its progressive policies and politics are quickly earning Portland the respect of urban designers, political activists, and environmentalists as the forward-thinking city it is — and that’s the real Oregon. 12000 SE 82nd Ave Happy Valley, OR 97086. The majestic mountains, snaking rivers, and old-fashioned wineries in Oregon could trick you into thinking you’ve arrived in heaven — and if so, you may want to top it off with a skin-caring experience at Lavelier. Our luxury skincare is infused with coral seaweed, known for its high antioxidant and micro-nutrient levels that help to defend skin against free radical damage and minimize the visible effects of aging. Drop by for a consultation with one of our skincare specialists and discover a skincare plan designed specifically around your needs.